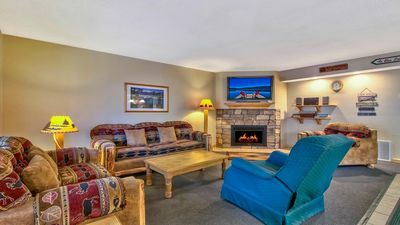 New furnishings, private hot tub, fireplace, & room for the whole family! 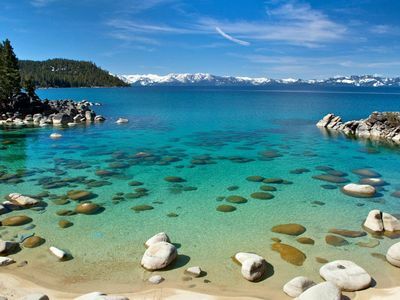 The Extravagant Tahoe Island Escape makes it easy to get the whole family together for a great getaway. 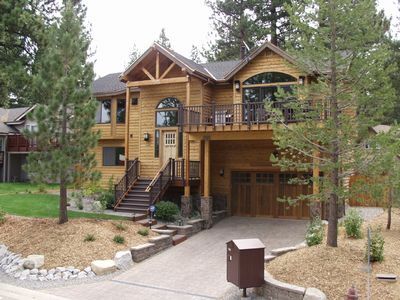 This South Lake Tahoe vacation rental has room for 12, a private a hot tub, fireplace, and a relaxing and luxurious, yet rustic, Tahoe vibe. 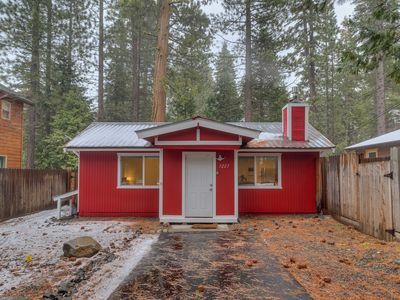 Centrally located on the South Shore, this Tahoe lodge is just over two miles away from Historic Camp Richardson Resort and Marina for hiking and time out on the water. 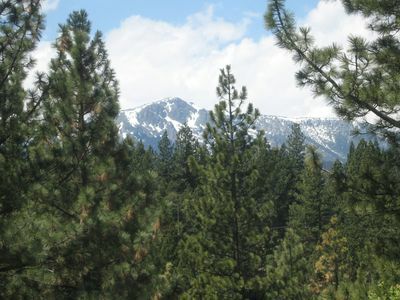 Just over six miles away is Heavenly Mountain Resort for outdoor adventures and Heavenly Village for shopping, dining, and family-friendly activities. 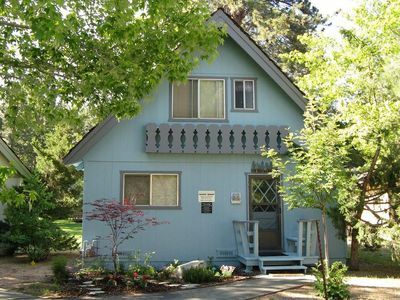 This charming rental features a spacious main living area with an extra-large, L-shaped couch in front a flatscreen TV with cable, Blu-ray, and DVD. With the stone-framed gas fireplace, you may want to play a board game on the soft carpet next to it. In the fully stocked kitchen you’ll have a marble-top island for serving up snacks to enjoy casually around the main floor. Each of your 12 guests will be easily accommodated here. Downstairs, you'll find a room with a twin trundle bed and a full bathroom. 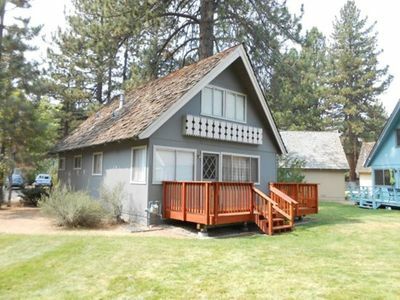 Upstairs are the three remaining bedrooms - one has a twin-over-full bunk bed, another has a queen-size bed, and the third is the master with a king-size bed, second fireplace, doors opening to the deck, and en suite bathroom with jetted tub! The upstairs level also has a futon and writing desk where you can use the WiFi on your laptop or tablet. There's a private washer and dryer so you can pack light. And, there's the hot tub. 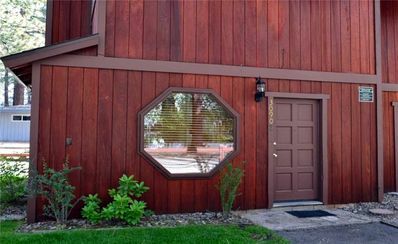 Nearby, find Camp Richardson Resort and Marina. Bring or rent rafts or head out on the trails. In winter go snowshoeing and cross-country skiing. More skiing is available at Heavenly Mountain Resort and Heavenly Village, which also offer restaurants, shops, and a spa. Maybe you can get a family pictures on their aerial gondola! 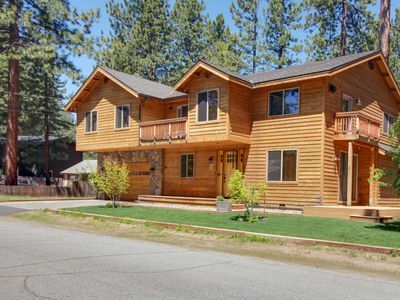 It's time to get together for a family reunion, and this South Lake Tahoe vacation rental is just right for you!